If big oil is on your radar as a potential investment, then you should probably narrow down your search to just ExxonMobil, Suncor Energy, and Total SA. In commodity-related industries like oil and gas, "stability" isn't a word that is used much. That is unless you are talking about the integrated oil and gas majors. The combination of size and having assets in every part of the value chain makes oil and gas a bastion of stability in an otherwise volatile market. While most of the companies in this industry provide for a decently safe investment in the industry, some are clearly better-suited for the long term than others. So we asked three of our energy contributors to highlight one big oil company they think is the best stock in which to invest for the long term. Here's what they had to say. Reuben Gregg Brewer: One of my favorite oil giants is ExxonMobil (NYSE:XOM). That's almost a cop-out at this point, but there are real reasons to like Exxon over its similarly sized competitors. For example, although every big oil company has pretty much stated it wants to protect its dividends, only Exxon has done so. The company's impressive annual dividend-increase streak marked 34 years in April. 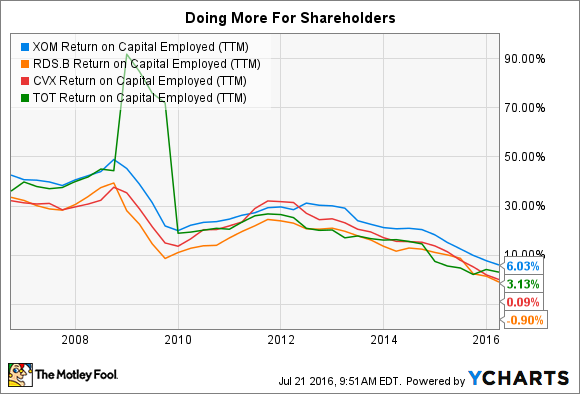 And while the company, like its peers, has been adding debt to its balance sheet so it can afford to pay the dividend and support its capital-spending plans, long-term debt sits at about 15% of the capital structure. So Exxon has more financial leeway than some of its closest peers. But the linchpin for Exxon is that it has, historically, led the industry in return on capital employed. What this metric says is that Exxon has put its shareholders' money to better use than peers have over time. That's the kind of company I want to own. Sure, the dividend yield of around 3.1% is lower than some others in the industry, but sometimes quality is worth paying for. In an often volatile commodity-driven business, I think high-quality Exxon, which executes better than the competition, is well worth the extra expense. Tyler Crowe: Normally there is a big trade-off when investing in big oil companies. In exchange for stability through the ups and downs of the industry cycles, you will give up a bit of growth. For the larger integrated oil and gas companies, growing production by 3%-4% is a big deal. That's what makes Suncor Energy (NYSE:SU) so interesting as a big oil stock. Not only do you get the stability of the integrated business model that has assets in every part of the oil and gas value chain, but Suncor has some big plans for production growth in the coming years. Thanks to some well-timed acquisitions and some major projects coming on line in the coming years, Suncor's management estimates that it will be able to achieve 6% production growth between now and 2019. I realize that doesn't sound large, but when compared to other large oil and gas producers, that is a massive increase. What makes this figure more impressive, though, is that the company has been able to maintain some balance sheet discipline that has kept its debt-to-capital levels below the 30% it has set as the high of its target range. Shares of Suncor are trading at about 1.4 times tangible book value today. That's pretty much in line with where shares have traded over the past several years and very similar to valuations for other big oil companies. Keep in mind, though, that Suncor stands to significantly grow production in the coming years while other integrated oil and gas companies shoot for much more modest growth. So there could be a lot of gains to be had with an investment in shares of Suncor today. Travis Hoium: Big oil companies face a lot of challenges in 2016. Oil is becoming harder and more expensive to find, prices remain perpetually low, and demand growth has been tepid. But the elephant in the room for big oil companies is the global realization that climate change is real and we need to do something to reduce carbon dioxide emissions. Earlier this year, 195 countries signed the Paris Agreement in the first global acknowledgement and plan of action on climate change. As a result, big oil has a target on its back. The world's thirst for energy isn't going away, though; it's just changing to a desire for cleaner energy from the sun and wind. And the only big oil company that's made a real effort to invest in those technologies in the long term is Total (NYSE:TOT), my top big oil stock. Total owns about two-thirds of solar panel producer and project developer SunPower, but it's not the panel business investors should be excited about. The great tie to the solar company today means access to solar projects that will generate revenue for decades to come. The companies partner in developing solar projects in countries where the oil giant has a presence and is buying those assets to hold long term. One big difference between oil and solar energy is that the sun isn't dependent on volatile commodity prices, creating a predictable stream of cash flows, like a bond. As Total pours more of its oil cash flow into renewable energy projects that create consistent cash flows, it will have a more stable business that's prepared for the future. Solar isn't the only next-generation energy source Total has invested in. It has stakes in companies making biofuels and energy-storage systems, which could grow as policies are put in place to limit emissions that contribute to climate change. If you're looking for a big oil company that's preparing for the economic reality of a lower-carbon future, Total is a great pick.